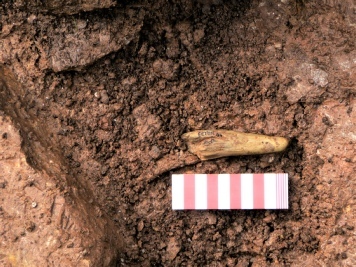 The EMRG was commissioned by the Peak District National Park Authority to undertake archaeological work to identify and excavate prehistoric extraction sites on Ecton Hill, located on the East side of the Manifold Valley in Staffordshire (2008-2009). This was part of a larger investigation looking at mining on this hill which was funded by Historic England. At Stone Quarry (Dutchman) mine the edge of an earlier opencast working was uncovered which had been backfilled during mining operations carried out in the late 17th century. Bronze Age bone mining tools and stone tools were recovered from the later spoil from this site, but there were no in situ prehistoric mining deposits. 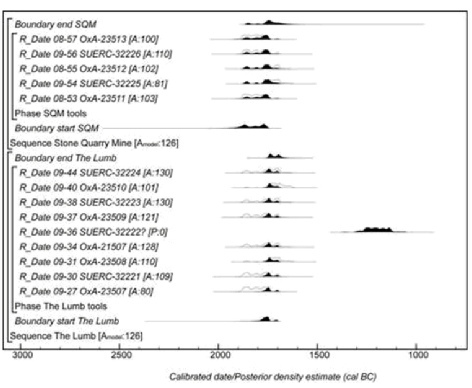 The radiocarbon dating of 12 bone tools from both these sites has suggested a period of working between 1800-1700 BC. When modelled statistically, these dates suggested that Stone Quarry may have been worked on for longer and prior to the Lumb, although this small scale extraction of just a few tons of one from each may only have lasted a matter of years, or at the most a few decades each. One of these sites disturbed by later (Medieval?) 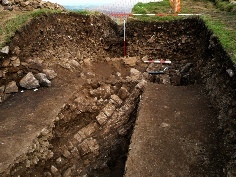 miners was then excavated. This revealed the top of the worked malachite encrusted limestone with tool marks, fragments of bone tools, an antler point and several stone implements. 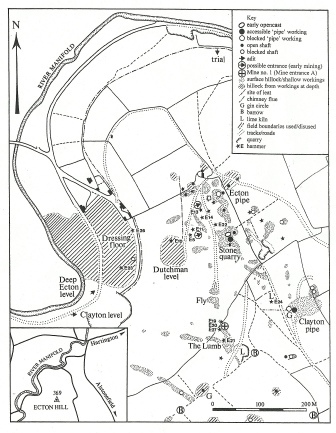 Map of Ecton Hill showing mine workings and Bronze Age extraction sites (J. Barnatt and B. Craddock). 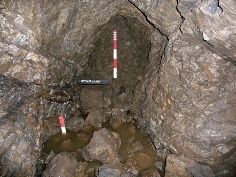 Shallow Medieval - Post medieval adit cut into base of opencast (S. Timberlake). 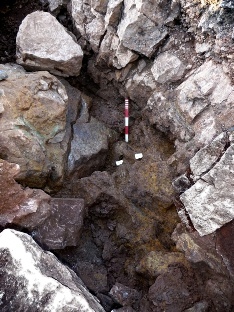 Top of excavated early opencast at Stone Quarry outcrop, 2008 (S. Timberlake). 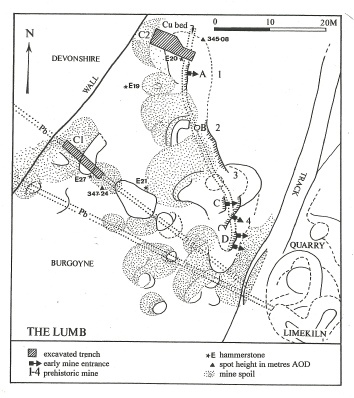 The Lumb outcrop and Bronze Age extraction. sites (from Timberlake 2014). 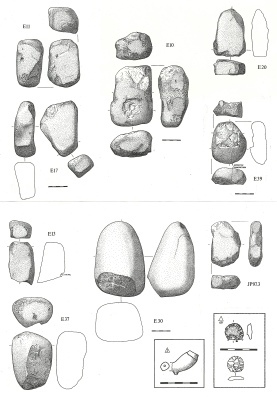 Radiocarbon calibrations of bone tools from Ecton excavations (Peter Marshall Historic England). Statistical model of duration of mining, (Peter Marshall Historic England).